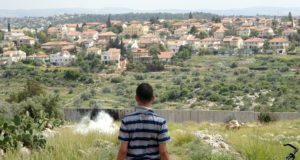 On Sunday 20th July, around 50 people joined the demonstration in Ni’lin and headed for the construction site of the apartheid wall. On their way they were attacked by a large number of Israeli soldiers shooting teargas missiles directly at the protesters. Later live ammunition was used at the entrance of the town. No injuries were reported this time. Earlier in the morning the bulldozers were delayed for a couple of hours after a successful roadblock action in the evening before. Just before sunset on Saturday 30th, Palestinians and internationals left a large amount of stones on the way leading to the construction site of the apartheid wall. Hundreds of metres of road were covered. 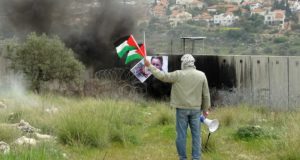 At the same time a demonstration was held at the site with chants and messages from a megaphone to the settlement on the other side of the valley. On Sunday morning the bulldozers could not pass for a couple of hours since it takes a lot more time to remove hundreds of smaller stones than a few bigger stones. The bulldozers were unable to begin working until 9:30. One and a half hour later the demonstration left the centre of Ni’leen. 50 protesters with Israelis and internationals headed for the construction site. 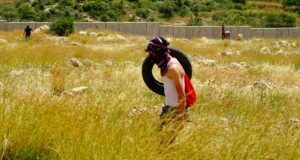 When entering the valley the soldiers shot teargas missiles at the heights of the directly at the heads of the protesters. After two and a half hours the people went back to the entrance of the town and some of them continued the protest. The soldiers answered brutally by using live ammunition. No injuries were reported at the time.